Come in hot or use stealth with the IBC Special Boats Division C-3 RECON. Fishing and hunting has never been easier than with the Bombard Commando C-3 RECON (an IBC Exclusive). Get to those fishing and hunting spots with ease and stealth whether by the clean and quiet fuel injected Yamaha F25 or by the integrated oar system. The RECON's strength is it's multi-mission capabilities that utilize Scotty Fishing componants allowing for rapid reconfiguration and force multiplying tools of the trade. Generous fishing attachments are strategically placed through out the boat making back bouncing, trolling, or bobber fishing a snap. Want to add a crap trap puller? Just remove a Scotty Fishing Rod Holder or other attachment and drop in the Crap Trap Puller (not included). Need a shotgun holder? Same drill, just drop in a Scotty Rod Rest/Yolk Attachment and you're hunting. 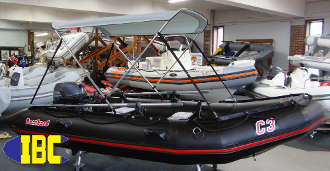 This package is an IBC Special Boats Division exclusive designed with the serious outdoorsman in mind, get it quick or it will slip by you in the night.